Notes: The Blyth & Tyne Railway reached Newcastle in 1864 with its terminus on the edge of the city centre, some 300 yd north of the North Eastern Railway’s Manors station, and 200 yd north of that company’s Trafalgar Goods depot. but stylish, Italianate structure in ashlar, with pilasters and a hipped roof. The OS 25” map of 1896 shows the station’s island platform, with a side platform to its west, adjacent to the main building. There were several sidings to the east, as well as to the north, where there was a two-road engine shed. with half continuing around the Coast Circle through Whitley Bay, Tynemouth and Wallsend to Newcastle Central. 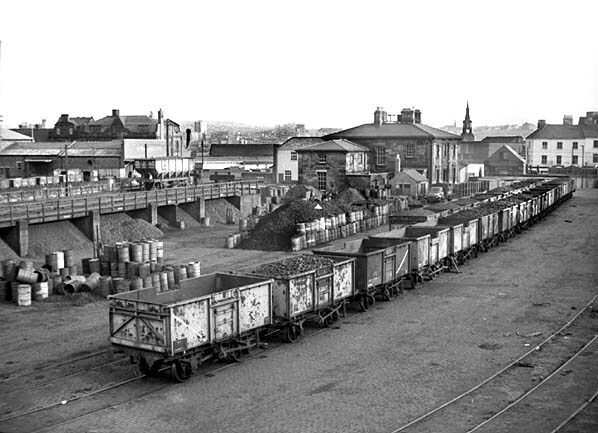 line, New Bridge Street was retained as a goods station. It expanded to the west, necessitating the demolition of most of Picton Place (but not Picton House), and to the east. On the eastern site a massive, futuristic reinforced concrete goods warehouse was constructed, designed by NER Chief Architect William Bell. 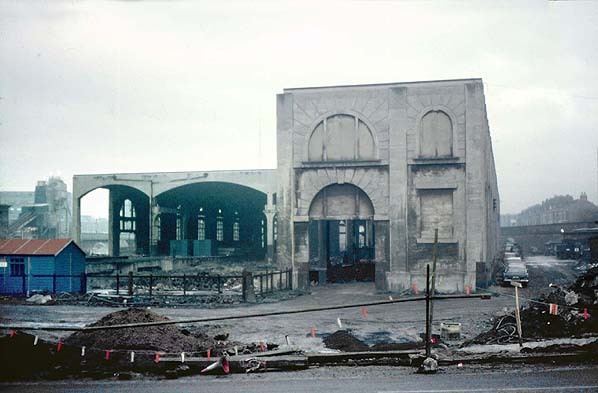 Although seriously damaged by an air raid in 1941 much of the structure survived beyond withdrawal of goods services in 1967 and was not demolished until the 1980s. 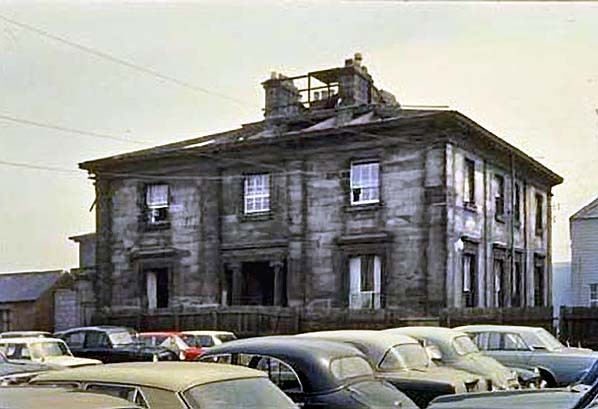 Picton House was demolished in 1970. 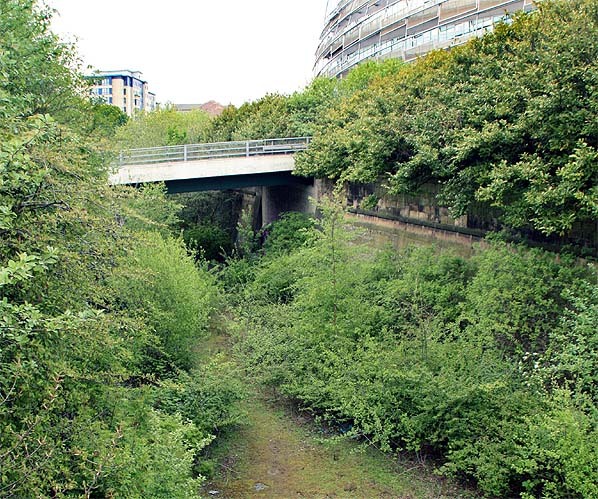 Bridge Street) to Tynemouth, making the Holywell – Prospect Hill – Percy Main route, and the ‘Avenue Branch’ between Hartley and Whitley (Monkseaton) redundant. These two lines closed in June 1864 on the day when the Newcastle – Tynemouth service was inaugurated. were replaced with a splendid new through station. 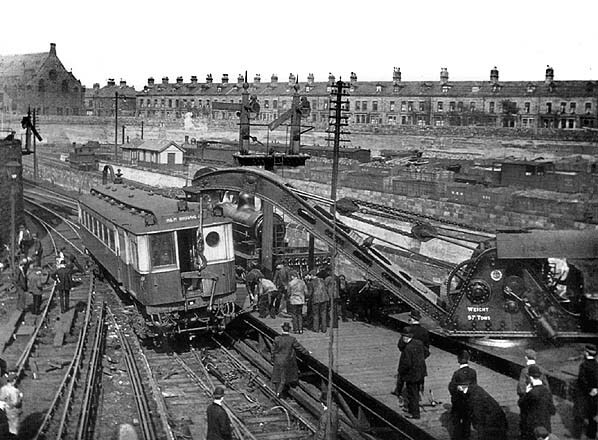 This created the coastal section of the familiar Coast Circle and Metro route, although there were to be realignments at Whitley Bay in 1910 and Monkseaton in 1915 where new, larger stations were built. Coast Circle as the basis of such a network, which was to become the Tyne & Wear Metro. Tickets from Michael Stewart except 8219 CJ Dean and goods labels from Brian Johnson. 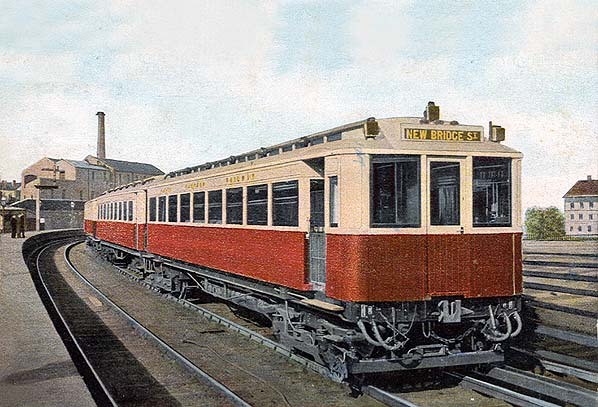 1906 Bradshaw from Chris Hind, Electric timetable from Alan Young. Route map drawn by Alan Young. To see other stations on the Blyth & Tyne Railway Newcastle - Backworth line click on the station name: Manors North, Jesmond, West Jesmond*, Moor Edge, South Gosforth*, Longbenton*, Benton (1st site)*, Benton (2nd site)*, Forest Hall (B&T), Benton Square and Backworth (2nd site). 1919 1:2,500 OS Map. In 1909 the north-south route through Manors (North) was opened, and it sliced through the site of the New Bridge Street terminus station. 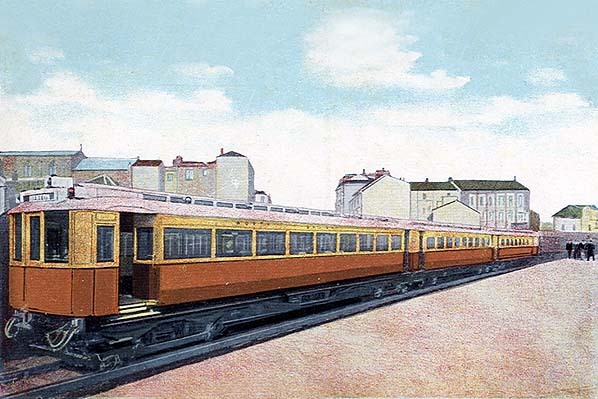 This bisected the old station, with the former passenger platform area, which was converted into goods sidings, detached from the main, and expanded, goods area to the east. The huge goods warehouse, designed by William Bell in 1903, and built in ferro-concrete dominates the eastern site. 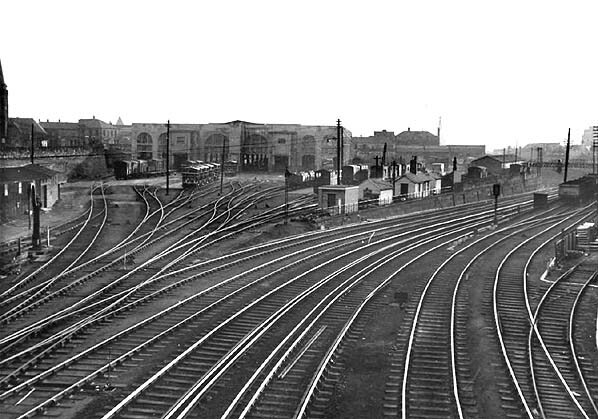 Manors (North) and the earlier Manors (East) are shown simply as ‘Manors Station’. A north-to-east chord, allowing through movement of stock between Jesmond and Heaton, is shown. Picton House, which served as the station building for New Bridge Street station as well as the Blyth & Tyne company offices, remains in situ on this map. 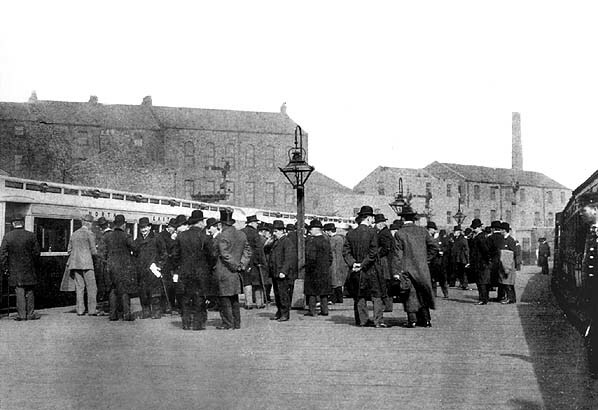 New Bridge Street station looking north on 29 March 1904. The inaugural run of the electric service from to Benton is about to take place, and the official party and guests are foregathering on the island platform. A splendid gas lamp can be seen in the foreground. New Bridge Street, looking north from the island platform, with a 1904 emu in a siding. The tracks in the background were the goods facilities, but the 1909 link between Jesmond and Manors North (running parallel to these sidings) was excavated through this site. 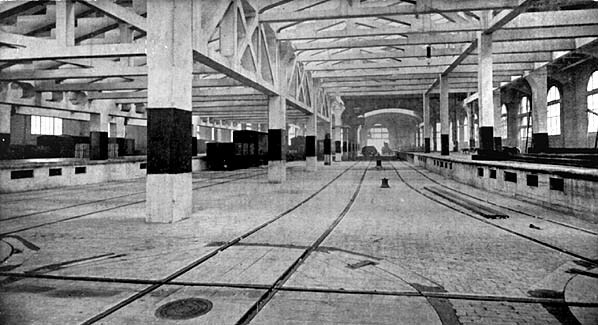 The interior of New Bridge Street goods warehouse (completed 1912). This view shows the first floor with a turntable that will take a 42-ton loaded wagon. 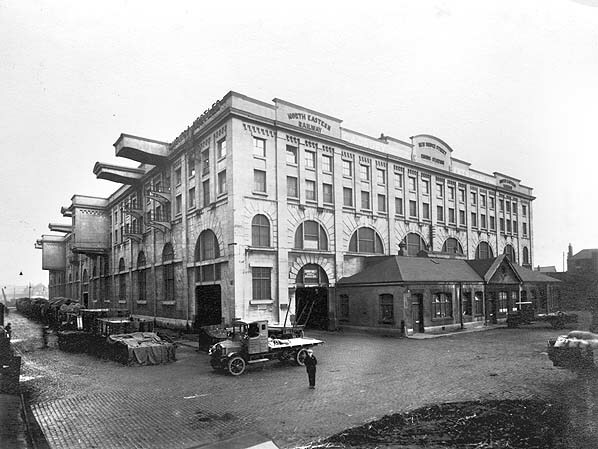 The goods warehouse, designed by William Bell in 1903 and completed in 1912. This huge ferro-concrete structure is seen from the south-west. The office building, whose style could not be more different, stands in front. 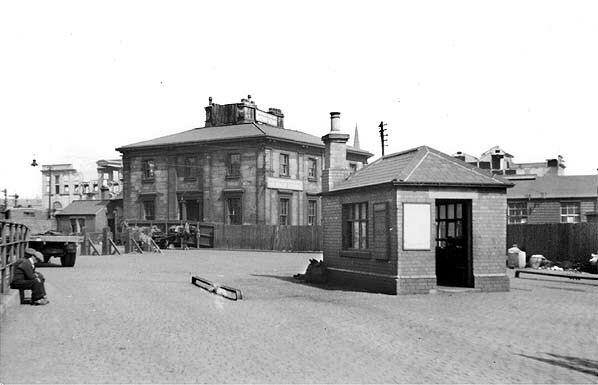 Picton House, the former New Bridge Street passenger terminus, looking north-east in 1949. In the background the ferro-concrete warehouse (completed 1912) can be seen in its damaged condition, following wartime bombing and a disastrous fire in 1941. 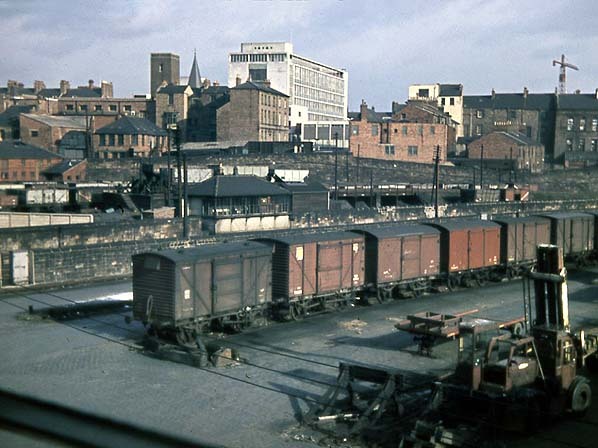 The site of the New Bridge street passenger platforms was later occupied by a coal yard as seen in this view from the late 1960s. Picton House is seen to the rear. The south façade of the elegant Picton House, formerly serving New Bridge Street station and accommodating the B&T offices, during demolition in April/May 1970. The ‘Central Motorway East’ (now A167M) required its site. It is ironic that the name of John Dobson, the architect of this building, is immortalised in a particularly unattractive thoroughfare, opened a short distance to the west about the same time that Picton House was removed. Although closed in 1967 New Bridge Street goods depot survived in a derelict state until the 1980s. This view is from January 1973. 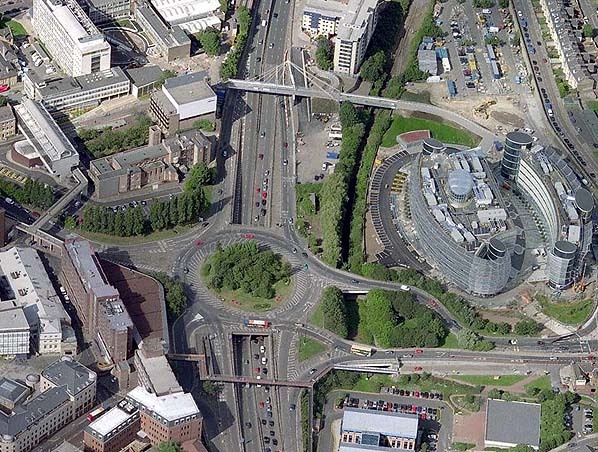 Aerial view showing the site of New Bridge Street station c.2008. The station was diagonally positioned where the off slip road is seen the the west of the roundabout. The new alignment of the B & T into Manors North bisected the station site. This line can be seen between the motorway and the City Campus of Northumbria University. Picton House was to the left, where the roundabout is now seen, while the platforms extended into what is now the university car park. Looking north from the on slip road towards the site of New Bridge Street station in May 2012. The station was at a much lower level. The bridge is the off slip road for the motorway. 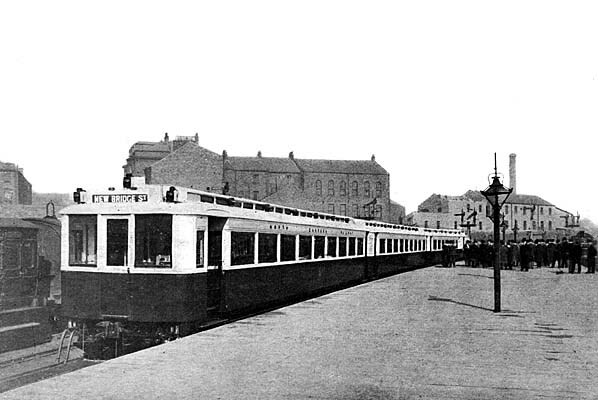 The B & T line into Manors and Newcastle Central is covered over at this point.